THE Geelong Cats are one of the two new sides entering the AFLW competition this year, and rather than finding players from other clubs, they have largely focused on adding local talent to their line-up. The Cats received the first two picks in the draft and snapped up two of the most exciting players in Nina Morrison and Sophie Van De Heuvel, who will certainly turn heads as the competition goes on. Local talent dominates this list, with 20 players featuring in Geelong’s 2018 Victorian Football League (VFLW) side. The Cats made the Grand Final and came up short against the Hawks, but showed what they are capable of with their list. Add experienced spearheads like Aasta O’Connor, Melissa Hickey and Phoebe McWilliams to the side and Geelong has a very potent line-up. The Geelong midfield is stacked with talent, led by Geelong Best and Fairest winner, Richelle Cranston. Cranston consistently racked up high numbers of disposals for the Cats during the VFLW season, and was complemented by a core group in Cassie Blakeway, Maighan Fogas and Hannah Burchell, who stepped up each week and are likely to do so again in the AFLW. Add in Geelong Falcons premiership duo, Nina Morrison and Olivia Purcell, who both also played in the Grand Final for the Cats. Morrison’s chase-down speed is unbelievable, and she has shown that she can come up against bigger bodies, having to deal with a Meg Hutchins tag in the VFLW Grand Final. Purcell is a tackling machine and led the way for both the Falcons and the Cats with her ferocity, so expect 2019 to be much the same from her. While Geelong has plenty of exciting forwards, its defence may come under pressure with the attacking forward lines that a lot of sides boast. Georgia Clarke will come into the mix as a calm and composed defender, and will have to work with the likes of Elise Coventry and Bec Goring, who were mainstays in the Cats’ defence in the VFLW. While Coventry is a consistent player, she often goes missing in the disposal count, so she will need to work on that coming into the AFLW season. Rebecca Webster is likely to be a key part of Geelong’s defence, even though she can play through the midfield too. Webster has a booming kick and strong hands, so if she floats into the midfield, it could leave a big gap in the defensive 50. Being the number one pick comes with a lot of pressure, but Morrison knows how to handle it. Having only picked up a football in a competitive environment three years ago, Morrison had a ripper 2018, sharing the TAC Cup Girls Best and Fairest and the Most Valuable Player (MVP) award at the Under 18 Championships. Her outside run is incredible, and her take-off speed is really something to watch. She is a precise kick and has shown that she can use it anywhere, having spent some time up forward for the Falcons last year in the TAC Cup Girls competition. Expect her to get a Rising Star nomination this season. The Geelong Falcons Best and Fairest was one of the most fierce tacklers in the TAC Cup Girls competition. She’s also a great clearance player, and knows how to hack it out of congestion with ease. She thrived in the Geelong VFLW environment, having played alongside players like Richelle Cranston. Purcell represented Vic Country in 2018 as well and was one of the leading disposal-getters in every match, highlighting her ability to find the footy with ease. A player that already has experience in the AFLW, Boyd will be a pivotal player for the Cats this year. She thrived in the ruck and through the forward line for Geelong’s VFLW side, taking big grabs and kicking crucial goals when needed. With plenty of ruck support in the team in the form of Aasta O’Connor, Kate Darby and Rene Caris, expect Boyd to spend some time up forward, as her marking prowess will give defenders massive headaches. The Cats certainly have the line-up to turn a few heads this season. With all the focus on North Melbourne’s star-studded line-up, the Cats’ has largely gone unnoticed, which the side will not mind at all. With Melissa Hickey leading the brigade as skipper and VFLW Grand Final coach, Paul Hood at the helm, it is hard to see where the Cats could go wrong in 2019. Gelling together will be the main challenge, as it always is for a new side. They have a hard draw to start off with, taking on the AFLW’s two premiership teams in Adelaide and the Bulldogs in the first four weeks, but those games are bookended by matches against Carlton and Collingwood. Expect Geelong to come out firing in 2019 and turn a few heads. THE Cats trusted in their local talent, drafting six players from either the TAC Cup Girls or Victorian Football League (VFL) Women’s team ahead of their inaugural season. Two players were drafted from the Greater Western Victoria (GWV) Rebels, while one hailed from the Murray Bushrangers. After making it to the VFLW Grand Final, coach, Paul Hood appears to have huge faith in his local ready-made talent. There is not much that hasn’t been said about Nina Morrison. She was long touted as the number one pick, and lived out that dream. At the AFL Women’s Under 18 Championships, Morrison also took home the Vic Country Most Valuable Player (MVP) and the overall tournament MVP with Madison Prespakis. She also shared the TAC Cup Girls Best and Fairest award with Prespakis. Now, Morrison has the opportunity to show the nation what she’s made of and undoubtedly, her electric chase-down speed and fierce tackling will be on display. Her explosiveness down the wing combined with her ability to rack up the footy will be invaluable for the Cats. Van De Heuvel’s versatility will be of much use to the Cats. She played mostly in the forward line during the TAC Cup Girls season but also spent some time in the midfield in the AFL Women’s Under 18 Championships, highlighting her ability to break the lines and penetrate forward. Van De Heuvel was GWV’s leading goal kicker this year with six goals from seven games and made the 2018 TAC Cup Girls and All Australian teams on the half-forward flank. She will be a great help to Kate Darby, Danielle Orr and Phoebe McWilliams inside 50. Webster is another versatile player, but thrives off running off the half-back line. She can shift into the midfield when needed as well, due to her valuable booming kick that sends her team forward. She was named at full-back in the TAC Cup Girls Team of the Year and represented Vic Country this year, making herself known in defence. Webster is a great overhead mark and has brilliant run and carry, which will really assist the smarts of Anna Teague and Melissa Hickey. Purcell was one of the fiercest players in the TAC Cup Girls competition, hurting players with her clearances and aggressive tackling. Purcell’s immense power helps her break through congestion and enforce her blistering run and carry. She had a marvellous year, taking home the Geelong Falcons’ Best and Fairest, playing in a premiership with the side, playing in a Grand Final for the Cats’ VFLW side, making the TAC Cup Girls Team of the Year and All Australian team. She will provide great support for Richelle Cranston, who can also hurt players with her power, aggression and run and carry. Denby Taylor was one of the smartest defenders in the TAC Cup Girls season, hurting players with her solid hands and run and carry off the half-back flank. She can be rotated through any position in defence, and also proved she could dominate on the wing, winning the best on ground award in the TAC Cup Girls Grand Final while playing in that position. It will be interesting to see what Paul Hood does with her, given her capabilities, but undoubtedly, she is a very handy pick-up for the Cats. Another defender with solid hands, Clarke and Taylor should work together in the back half to prevent opposition scoring. The Rebels defender made centre-half back her own in the TAC Cup Girls competition, creating a wall with her strong marking and kicking. Clarke was named in the TAC Cup Girls Team of the Year as the centre-half back, represented Vic Country in this year’s AFL Women’s Under 18 Championships and also spent some time with the AFL Women’s Academy. With a ruck line-up of Erin Hoare, Aasta O’Connor, Maddy Boyd, Kate Darby and the newly added Rene Caris, the Cats should dominate the midfield. Caris not only has a great leap but is agile at ground level, thanks to her clean hands and precise kicking. She was named in the TAC Cup Girls Team of the Year and also spent some time with the AFL Women’s Academy, giving her valuable experience in the Cats line-up. Caris featured for Carlton in the VFLW season, and proved that she could match it up against the bigger bodies in the AFL Women’s competition. Maighan Fogas was one of Geelong’s most consistent midfielders this year in the VFLW, thanks to her exciting run and carry, clean hands and accurate kicking. She came second in Geelong’s VFLW Best and Fairest after playing 17 matches and being named in the best seven times. Her ability to fight for the ball in congestion made her a standout during the season, and if she continues to bring this trait into the AFL Women’s season, it will prove vital in the Geelong midfield. Coventry is your traditional no-fuss defender that consistently gets the job done. She is a great lockdown defender, which will prove vital if the Cats are to stop dangerous attacking teams such as the Western Bulldogs. Coventry finished in the top 10 of Geelong’s Best and Fairest and played 17 games for six appearances in the best. Keryk worked incredibly hard to get back onto an AFL Women’s list in the off-season, after getting delisted by the Blues. She went over to the Cats halfway through the VFLW season and made an immediate impact with her ability to consistently rack up the footy and kick or handball long to get it out of congestion. Out of her 12 games during the season, she featured in the best on eight occasions, proving how damaging she is in the midfield. Her finals series was one to remember as well, gathering double-figure disposals in each match. Keryk’s experience combined with the youth of Morrison and Purcell will be fantastic to watch. Geelong has built a fantastic AFL Women’s side ahead of its first season in the competition.The Cats’ midfield will include Morrison, Purcell, Keryk, their forward line will feature the likes of Darby, Orr and McWilliams while their defence will be stacked with Clarke, Taylor and Coventry set to make a big impact. Add the ruck stocks of Aasta O’Connor, Erin Hoare and Rene Caris, and the Cats all of a sudden look very threatening to make a big statement in their first season of AFL Women’s. GEELONG had one of the most consistent Victorian Football League (VFL) Women’s seasons. The Cats only suffered one big loss during the season with the other two being respectable margins. They turned it on in the finals and made it all the way to the big stage from fourth place. Clifford was a deserved VFLW Team of the Year member after she transformed her game this season. After previously spending time as a defender, Clifford made the forward line her own at the Cats and had a consistent season in front of the sticks. She kicked 15 goals from 17 games and topped off her solid year with a fifth place finish in Geelong’s Best and Fairest count. One of her best games came in Round 5, when she kicked two goals, gathered 20 disposals, took eight marks and laid seven tackles. Fogas was a ball magnet throughout the year for the Cats. She was an agile player who could use the football really well, whether it was by hand or by foot. Fogas finished second in Geelong’s Best and Fairest count after a solid year in the midfield. She was a crucial player in Geelong’s one-point win over Melbourne University, racking up 23 disposals and laying eight tackles. McMahon was a real handy player for the Cats as they were able to throw her into a variety of positions. She impressed with her versatility throughout the year and looked like a ready-made AFL Women’s player, which earned her a spot on Geelong’s list. McMahon finished third in Geelong’s Best and Fairest count after averaging 14.1 disposals, 2.7 marks and 12 hitouts per game this season. She led the way in Round 4 with 22 disposals, four marks and five tackles in the Geelong’s win over Carlton. Cranston was a deserved winner of Geelong’s VFLW Best and Fairest, with a stellar year in the midfield. Her strength in congestion was almost unmatchable as she was able to break the lines and use her long kick to propel her side forward. Cranston was also named in the VFLW Team of the Year as she consistently racked up high numbers of disposals throughout the season, proving to be a real headache for opposition sides. She had a stellar game in Round 5, gathering 26 disposals, taking five marks and laying six tackles. The Geelong skipper led from the front all season, matching up on key players in defence and keeping them quiet. Goring was smart with her ball use, and used it well by hand and by foot. Her run and carry out of defensive 50 was also handy, as it allowed the Cats to go forward with ease. In Round 11, Goring played a great game against Casey, racking up 18 disposals and taking seven marks. Keryk has probably been one of the most successful mid-season recruits in the VFLW. She played 12 games for the Cats this season (including finals) and her impact was profound. Keryk’s inside work was spectacular as she was able to feed the ball out of congestion with quick hands. Her run and carry was also key as it allowed her to break the lines and use her long kick to send the Cats forward. She had a remarkable finals series, but in terms of the home and away season, she dominated in Round 11 with 19 disposals, four marks and 11 tackles. The future is certainly looking bright for Geelong, with the Geelong Falcons TAC Cup Girls side winning the premiership, the VFLW side featuring in the Grand Final and the AFL Women’s list starting to take shape. A lot of VFLW players showed plenty of promise and a lot of players could slot into an AFL Women’s side. The Cats produced some big winning margins during the year and scraped over the line on other occasions, showing their ability to get the job done. Geelong will certainly head into the VFLW next year as one of the premiership favourites. THE Hawks have made history in the Victorian Football League (VFL) Women’s league after an 11-point win over Geelong in the Grand Final. Not only did the team lift up its first ever VFLW premiership cup, but it was also stalwarts of female football, Meg Hutchins, Lou Wotton and Phoebe McWilliams who got to experience premiership success for the first time. Basketball convert, Chantella Perera was the deserving recipient of the Lisa Hardeman medal with 13 disposals, four marks and five tackles in defence. Greater Western Sydney (GWS) forward, Rebecca Beeson (24 disposals, three marks, four tackles), VFLW rising star, Jayde Van Dyk (19 disposals, four marks, six tackles) and Eastern Ranges midfielder, Mikala Cann (14 disposals, nine tackles) also impressed for the Hawks. If Geelong had won, Vic Country duo, Olivia Purcell and Nina Morrison would have been hot favourites to claim the best-on-ground accolade, and could have claimed it even though their side lost. Purcell gathered 19 disposals and a game-high 11 tackles while Morrison racked up 20 disposals and laid five tackles. New Geelong AFL Women’s forward, McWilliams was up and about early, creating the first goal for her side. She marked the ball just outside 50 and kicked it to the top of the square where Tamara Luke marked and kicked truly for the Hawk’s first of the day. Geelong fought back with a strong goal-line tackle provided by ruck/forward, Maddie Boyd. Boyd dispossessed Hawthorn defender, Jessica Sibley and then booted through the Cats’ first major from a tough angle just outside the goal square. Despite a dominant first quarter for the Hawks, they matched their goal with four behinds, giving them a slim two-point lead at quarter time. After two behinds from McWilliams and Meg Hutchins to kick off the second quarter, it was unsurprisingly captain, Emma Mackie who steadied the ship with a goal halfway through the term. At the other end, the Hawks’ defence kept Geelong scoreless for the quarter, giving them an 11-point lead at the main break. The Cats tried to bounce back in the third term but wasted their opportunities. They finished the term goalless, with behinds from Hannah Burchell, Maighan Fogas, Danielle Orr and Mia-Rae Clifford. These wasted opportunities hurt more when Sarah Perkins kicked a major in the dying stages of the game. In the Hawks’ only inside 50 of the quarter, McWilliams was again involved with a long kick inside 50 ending up with Perkins. Perkins gathered the ball with two opponents hanging off her, yet still managed to grab it cleanly and snap it through for the Hawks’ third goal. This gave them a lead of 13 points at the last break, leaving Geelong with a lot of work to do in the last 20 minutes of the game. The Cats responded immediately though, with a long kick from ruck/forward, Maddy McMahon ending up in the reliable hands of new Geelong AFL Women’s recruit, Kate Darby at the top of the square. She made no mistake from directly in front, reducing the deficit to seven points. But not long after, it was Hawthorn forward, Emily Gilder who kicked the sealer with a set-shot goal from about 25 metres out. This ended the scoring for both sides, and meant that Hawthorn claimed one of the most historic 11-point wins in female football. Hawthorn: S. Perkins, T. Luke, E. Mackie, E. Gilder. Geelong: M. Boyd, K. Darby. BIG wins from NT Thunder and Geelong combined with a loss to Hawthorn made for a shake-up of the Victorian Football League (VFL) Women’s top four in Round 13. In other games, the Casey Demons defeated the Blues, the Saints upset the Dogs and the Pies took care of business at RAMS Arena against the bottom of the table Bombers. The Casey Demons held on to a 10-point victory against Carlton as the Blues failed to capitalise on their chances late in the final quarter at Casey Fields. Carlton was 16 points down at the final change, needing four goals in the last quarter to win. However, the Blues had only kicked three majors for the game, making for a very difficult task. They had the advantage of a major breeze in the last term but unfortunately for the Blues, they only were able to kick six behinds in the last quarter, missing crucial chances in front of goal. The Demons’ dominant first term negated Carlton of any chance of scoring, as they locked the ball inside their forward 50 for the majority of the quarter. Their first quarter dominance was soon squandered as Carlton got its chance to attack with the breeze, as Vescio showed why she is such a star. 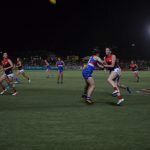 The Blues denied Casey for a large part of the third term, as they placed a number behind the ball, but Katherine Smith broke the drought with a smart goal out a pack moments before three quarter-time, allowing the Demons to hold on for victory. 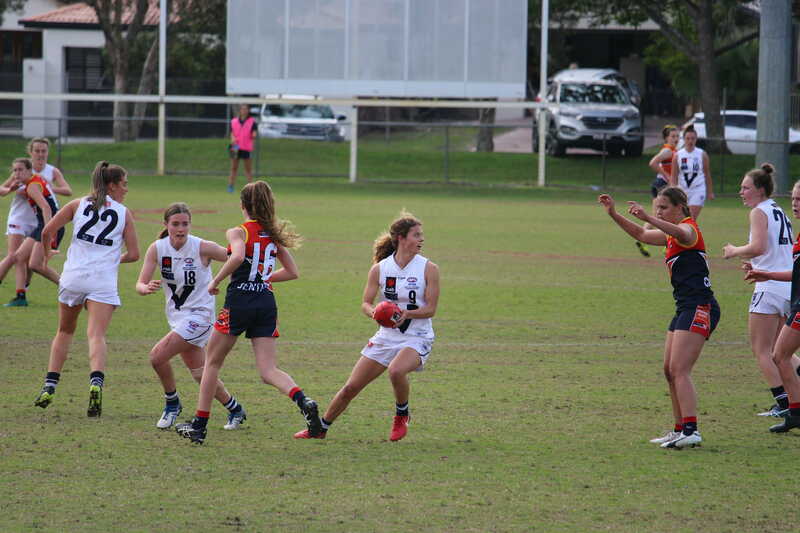 Eden Zanker starred for the Demons up forward as she kicked two goals within the first five minutes of the game, ending up with three for the match. For Carlton, Darcy Vescio stood up when needed, taking big marks and kicking a crucial goal. She made her Demon opponents nervous whenever she was near the ball. 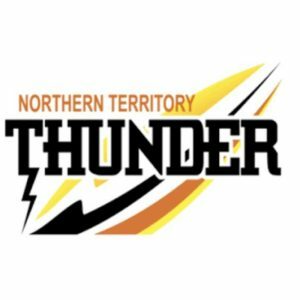 NT Thunder got another win on the board in stunning fashion, defeating the struggling Seagulls by 55 points. The Thunder led at every break and did the most damage in the third quarter. 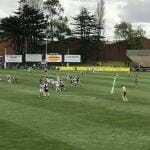 The away side kept Williamstown scoreless and kicked four unanswered goals to sit a at second on the ladder and a game ahead of Hawthorn. In her return to the NT lineup, Anne Hatchard did not disappoint. The Adelaide AFLW forward booted four goals while Crows teammates, Jessica Sedunary and Georgia Bevan each kicked one major. Bevan was named best on ground for the Thunder and was complemented by fellow goal kicker, Emma Swanson, who has been in fine form for the Thunder this season. Tayla Thorn also played a great game for NT, kicking two goals and making her way into the best as well. It was all single goal kickers for Williamstown, as the side only scored four majors for the day. Georgia Harris, Jess Duffin, Sarah Chapman and Sharnie Whiting were the ones who got on the board with a goal each, doing what they could to provide a contest. A standout in that area was Rebecca Dardengo, who was named best afield for the Seagulls in the loss. She was complemented by Belinda Hateley, Chloe Portelli, Jenna Bruton and Jessica Bartolo. In one of the biggest wins of the season, the Cats took care of the Tigers, easily beating them by 59 points. Geelong held Richmond scoreless for three quarters and used the third quarter to blow the game out of the water. In that quarter, the Cats got out to a 65-point lead, thanks to kicking six unanswered goals. Mia-Rae Clifford had an absolute day out in the blue and white hoops, kicking four majors for the day, two of which came in the first quarter. Maddie Boyd also joined in the scoring, kicking two goals and being named best on ground for her efforts. Richelle Cranston continued her stellar season at Geelong, as she booted a goal on the weekend and contributed well around the ground. She too was named in the best Geelong players for her great game. Maighan Fogas, Erin Hoare and Cassandra Blakeway also had performances to remember, playing solid games on the day. For Richmond, it is no surprise to see who was named best on ground. Phoebe Monahan has been an exceptional midfielder for the Tigers this season and was no different on Saturday. Despite the heavy loss, she managed to make her efforts shine through which was a positive for Richmond on a dour day. Monahan was complemented by good games from Murray Bushrangers midfielder, Tamara Smith as well as Ella Ross, Alice Edmonds, Laura Bailey and Lisa Davie. Jess Gardner was the only goal kicker for Richmond, booting through a major in the last quarter. In a relatively low-scoring affair, it was the Darebin Falcons that took home the four points, knocking off the third-placed Hawks. It was a scrappy game with neither side able to capitalise on their scoring opportunities and often fumbling the ball. Both teams struggled to break away from one another with the final margin being a mere four points, making for a hotly contested match. Most of the game was played between the arcs, resulting in a lot of stoppages and very few shots on goal. For the Falcons, the experience and class of players such as Elise O’Dea and Jessica Dal Pos stood out with their ability to open up the space and create some good run and carry through the middle. O’Dea bagged an important goal for her side, and showed great leadership in trying times to will her side back into the contest. Teammate, Kate Shierlaw also impressed for Darebin with her composure and ability to take strong marks under pressure while Meghan McDonald starred down back, taking a number of good intercept marks to stop the flow of the Hawks. The likes of Meg Hutchins and Phoebe McWilliams continued to impress for the brown and gold with their constant intent to win the footy and impact on the contest. Jayde Van Dyk was also amongst the Hawks’ best with her clean hands in close and ability to read the play well. Teammates, Rebecca Beeson and Jessica Sibley also worked tirelessly all game, racking up the touches and imposing themselves around the contest. In one of the biggest upsets of the round, the Bulldogs were knocked off their high horse and came crashing back down to Earth against the Southern Saints. They kicked their only goal of the game in the first quarter, and were completely shut down by the Saints for the rest of the game. The Saints were able to increase their lead at each quarter break and ended up taking home a 31-point win. Tara Bohanna was the focal point up forward with three majors while Courtney Munn, Amy Silver and Holly Bate all chipped in with one major a piece. Kayla Ripari continued her solid season on Sunday, being named best on ground for the winning team. Ruck, Rhiannon Watt was just as impressive and has also had a consistent season, backing it up on Sunday by being named second best. The duo were complemented by Vic Metro Under 18 pair, Eleanor Brown and Gabriella De Angelis, who also earned a spot among the best players. For the Bulldogs, April Goldring and Libby Birch were the standouts in the loss. In her first game for the season, Hannah Scott contributed well in her first VFLW game, although she would’ve liked to have taken home the win. Fellow AFLW teammates, Angelica Gogos, Lauren Spark and Ashleigh Guest all also did well on the day. Collingwood got off to a fast start in this match, kicking the first four majors of the game. Essendon then fought back in the second quarter, outscoring the Pies two goals to one. But Collingwood’s winning form prevailed, holding onto victory in a tight tussle at RAMS Arena. Oakleigh Chargers skipper, Hannah McLaren was named best on ground for the Magpies in what was a memorable performance for her. Her Chargers teammate, Daisy Bateman also made an impact by kicking a goal on the day. Iilish Ross, Jessica Edwards and Sophie Casey also kicked singles while AFLW captain, Steph Chiocci booted two majors. Collingwood AFLW teammates, Brittany Bonnici and Holly Whitford also put in solid performances in the win. Irena Malliaras, Monique DeMatteo and Tanya Hetherington were the goal kickers for the Bombers in windy conditions. Hetherington was also named in the best for Essendon for her great game but she was bettered by one player in Jessica Anwyl, who was named best on ground for the losing side. The duo were complemented solid performances from Courtney Ugle, Natalie MacDonald, Maddy Collier and Alexa Madden. 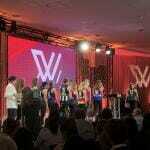 THE Best and Fairest is by far one of the most coveted awards in the Victorian Football League (VFL) Women’s. They say that personal awards should not matter in a team sport, but credit is due to the fantastic individuals who can lead their teams to finals or just show unmatched skill on the field. In the Round 11 edition of Number Crunching, we will try to predict the 2018 VFL Women’s Best and Fairest winner. This was done by tallying the amount of times a player was named either the first or second best by their coaches in each match. Leading the table is Darebin player, Nat Exon. Exon has made it into the top two six times out of the seven games she has played in. The midfielder has shown to be strong for Darebin, with an average of five tackles per game. Exon’s ability to command her midfield has led to four wins out of the seven games she has played. Second to Exon is AFLW Best and Fairest winner, Emma Kearney. Despite only have played five games this season, Kearney’s style of play has proven her to be just as great as a player in the VFLW as she in the AFLW. With an average of 23 disposals per game, her ability to move the ball around does not go unnoticed. The Melbourne Uni star continues to make a statement on the field, with the drive to win Best and Fairest twice this year. The third most likely to win the VFLW Best and Fairest is Collingwood’s Jaimee Lambert. With six goals already this season, Lambert is Collingwood’s second highest goal kicker. The midfielder’s skill doesn’t stop there with an average of five tackles per game. Lambert’s attacking style of play has proven to be very successful for Collingwood with six wins out of the eight games she has played for the Pies. Lambert is a quieter personality, but with Collingwood’s great season so far, she shouldn’t be overlooked for the Best and Fairest. With the season only just over half completed, there is still plenty of chances for the list to change. In saying that, these players have shown great individual merit and therefore deserve to be acknowledged for that. After their 41-point loss to Geelong, the Demons failed to register a player in the best 22 this week with Kaila Bentvelzen’s two goals not quite enough to get into the forward six. Marinoff was a lock in this week’s best 22 after dominating in the midfield against Richmond. 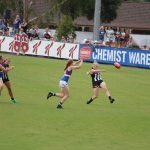 In just her second game in the Victorian Football League (VFL) Women’s competition, she is starting to hit her strides at the right time of the season. In the same game, Courtney Wakefield starred for Richmond up forward with three goals and an everlasting presence in the forward 50. Jasmyn Hewett has been dominating in the ruck for the Thunder and once again has claimed her credentials for the VFLW Team of the Year. 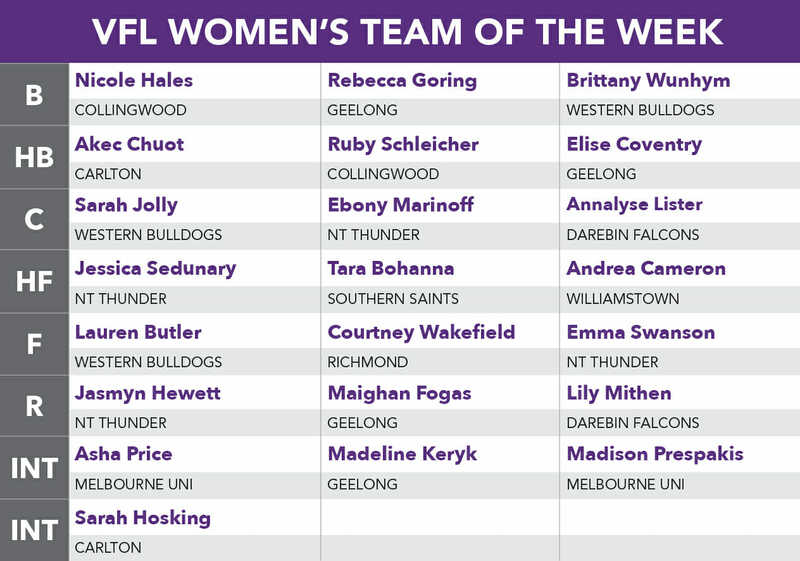 Madison Prespakis also slots straight back into the VFLW Team of the Week after finishing her Under 18 representative duties. She will be hoping to keep her spot and help drive Melbourne University out of the bottom three. Geelong’s Kate Darby was unlucky to miss out this week with two goals and 16 disposals against Casey.